Nearest: Tube & Railway Station: London Euston 0.2 miles (0.3 km), DLR Station: Tower Gateway 2.7 miles (4.3 km), Motorway: M1 Junction 1 5.3 miles (8.5 km). Within a half mile circle of the hotel (0.8 km) are no less than 4 mainline (overground) and 7 tube (underground) stations. 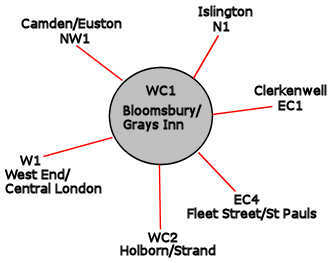 The Ambassadors Hotel Bloomsbury is situated between Euston station (to the North) and Russell Square (to the South). This area is on the border of central London (to the north of centre) and is just over a mile from the heart of London's nightlife at Covent Garden and the west end. The immediate vicinity of the hotel lacks the glamour of the main central areas but the trade off is the cheaper accommodation to be found on the outskirts. The hotel is on Upper Woburn Place which is a busy main road used as cut through for the City of London and to access the southern areas such as Waterloo Station via Waterloo Bridge. However it will make it easier to find a taxi. There are also many shops and amenities in the nearby Bloomsbury area including the Brunswick shopping centre. Close by is the British Library (0.2 miles), Egyptian Archaeology Museum (0.25 miles), Pollocks Toy Museum (0.5 miles), British Museum (0.5 miles), Dickens House (0.6 miles) and Regents Park (0.7 miles). Bedrooms are modern in style and facilities include en-suite with bathtub or adjustable high pressure shower, digital entertainment system, sound proofing, individually controlled air conditioning and heating, voicemail, free WiFi, Cable LCD television, electronic safe, Coffee/Tea maker, Direct Dial Telephone, desk, Electronic Door Locks, trouser press, Hair Dryer and Iron/Ironing Board. Each of the guest rooms are decorated in soft tones of cashmere cream, sand and sage while bathrooms are aqua in colour. Deluxe rooms are larger than standard and come with bathrobes and slippers along with Lifestyle and business magazines. Onsite is the air conditioned Number Twelve and bar where fine wines and fine Italian cuisine may be enjoyed. The restaurant uses the freshest ingredients and is open for breakfast, lunch, afternoon tea and dinner. The bar has a snack menu and a large screen television. The hotel offers conference/meeting facilities with 8 dedicated rooms which include the Chancery Room and The Westminster Suite with a capacity for up to 300 guests and all have modern equipment and amenities. Smaller boardroom type rooms available. The front desk is manned 24 hours and the hotel offers Dry Cleaning Services. Guests also have free access to the hotel gymnasium. Two Lifts provide access to all floors. The hotel has 8 meeting rooms providing a capacity for up to 260 guests. Fully non-smoking. Please Note: THERE ARE TWO AMBASSADORS HOTEL LISTED ON OUR SITE FOR LONDON. Compared to other London hotels: This hotel has been rated 74% by past guests. The London average is 80% and the average for 4 star hotels is 83%. Therefore this hotel is below average for its sector (star rating) . Milesfaster ranking: 643rd from 866 London hotels, and 277th of 328 four star rated hotels. Another to Consider: Another hotel that is much like the Ambassadors Hotel - Bloomsbury and not too far (0.0 miles, 0.0 km) would be the 4 star Novotel London Tower Bridge, where prices begin from around £165 and which has an 83% guest satisfaction rating. The Novotel London Tower Bridge also offers: free WiFi. Looking for lower base rates? Then another option might be the Holiday Inn Whitechapel. 0.9 miles away (1.5 km), has scored 86% from former guests and whose lowest rates start at about £84 (theres free WiFi too). The 50 nearest hotels around this area (12 Upper Woburn Place, WC1 postcode) which we have have on our website extend out to a 0.6 miles (1.0 km) radius. The numbers by star rating are 3 five star hotels (average rating 89%), 19 four star hotels (average rating 81%), 18 three star hotels (average rating 76%), 8 two star hotels (average rating 71%) and 2 one star hotels (average rating 62%). Coming out as the top rated hotel is Montague On The Gardens Hotel (4 star) at 99%. Base Rates: We compare area starting room rates by using base rates. Bear in mind we use the published base rates which do not reflect short term offers and deals. They do however give a decent relative comparison. Looking at all hotels in the area the average base rate is £96 per night. They range from a low of £16 at Generator Hotel (2 Star, 77%) up to £222 at Renaissance St Pancras (5 Star, 89%). Rates break down to the following for each star rating: Five Star average: £193, Four Star average: £113, Three Star average: £85, Two Star average: £56 and One Star average: £53. Using our in-house algorithm we rank hotels based on guest ratings and weighted for related factors. We have a ranking for Ambassadors Hotel - Bloomsbury 37th (joint) of 50 and 18th for the 19 four star hotels in the area. Our base rate rank for the hotel is 26th of 50 (6th of 19 four star hotels.). We use the base rate ranking and review ranking for the hotel to get an overall ranking of 34th of 42 for sheer value for money (Generator Hotel was top).